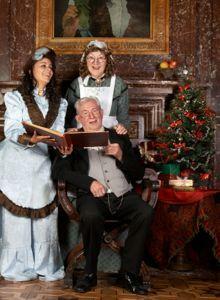 Although the tradition goes back further, Christmas caroler costumes are always Victorian. This was when caroling became immensely popular and the style, so reflective of a Currier and Ives drawing, is still preferred by carolers everywhere. One advantage of Victorian costumes for caroling, if you live in a chilly climate, is that they are warm. If you do a complete costume for a woman, for example, you will wear several layers of petticoats over heavy stockings (and perhaps some modern long underwear), a wool dress and a long cloak. Add a large bonnet and a muff, and you might almost be too warm. A man will wear long trousers, a knee-length coat, and a top hat. The look is simple and straight out of Dickens. Colors for both men and women are appropriately dark for winter, although they usually have a Christmas look with dark green and red trim. You might also add some fun festive touches like jingle bells and tinsel, although be sure these have an appropriate period look. Many costume shops offer a few Christmas caroler costumes. If you are going to be part of a group in a semi-professional capacity, you would do best to buy something from a theatrical shop, or have a costume made. A good costume like this will look authentic and last for years.For a cheaper costume, there are a number of options that will still look great. Bonnie's Treasures has a number of costumes for men and women. You can get a seven-piece men's costume in dark green consisting of a velour frock coat, black velvet best, white jabot, top hat, spats, gloves and black pants. The same costume is also available in burgundy. You can get a customized costume for a woman with blouse, skirt, belt, faux-fur muff and a two-hoop petticoat. The outerwear is trimmed in Christmas plaid. If you prefer to rent, rather than buy a costume, try Boston Costume. The available caroling costumes seem to only be for women but they have a rich authentic quality. The best Christmas caroler costumes will always be those you make yourself, especially if you are part of a group. This way, you can choose fabric and trim to make everyone match and still be individual. For the best patterns, you will probably have to search piecemeal. Start browsing at The Costumer's Manifesto, which can give you a lot of useful information and guides. You should also search sewing forums and eBay for discontinued Victorian patterns by Simplicity and Butterick. Women's caroler costumes will likely be more difficult and time-consuming to pull together than men's, but the end result will be well worth the trouble. You'll be the hit of Christmas Eve!